Hole in the Wall Subscription Box ~ Exploring Cities From Home! This box was provided free of charge in exchange for an honest review. I love traveling, and I love trying new things.. but as a busy mom, travel has been limited lately. I miss going on adventures and visiting new places, so I was excited to learn about Hole in the Wall. 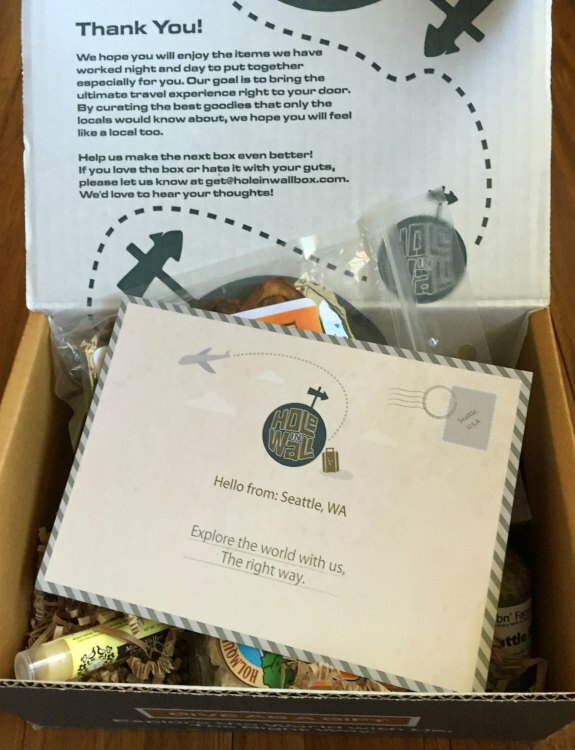 This is a pretty cool subscription box that takes you to different cities, via a box of goodies sent right to your door! I had a chance to try the Seattle box. Seattle actually has a lot of meaning for me because I visited family there as a young child, and although I haven’t been back, our close family members are moving there. I hope to make it out that way in the next few years, but in the meantime, I can check it out through my Hole in the Wall Box. Seattle is a city of many neighborhoods: Eclectic, urban, outdoorsy, artsy, gritty, down-to-earth, or posh—it’s all here, from the quirky character of the Seattle Waterfront and the eccentric “Republic of Fremont,” to hipsters walking baby carriages past aging mansions on Capitol Hill. There’s something for just about everyone within this vibrant Emerald City. Taking a stroll, browsing a bookstore, or enjoying a cup of coffee can feel different in every one of Seattle’s neighborhoods. It’s the adventure of exploring that will really introduce you to the character of Seattle. I dug right into my box when it arrived, excited to see what goodies were inside! Right away I loved that there were a variety of items in the box, and that it wasn’t just all food, and everything was useful. The box contains a card that lists all the items with some information about each as well as their price value. I received 8 goodies in my box, and I have to say I am enjoying them all! When I received my box, these were one of the first items that caught my attention. 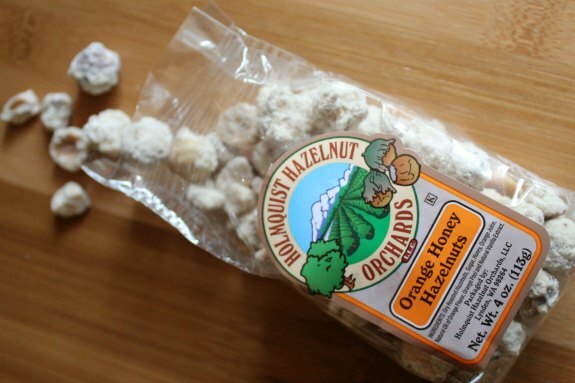 I had never even heard of a hazelnut orchard before, and this product is from a family run orchard near the Northern Cascades in Washington. If you’ve ever had candied nuts from a street vendor in NYC, these are the same kind of concept and are downright amazing! Tiny’s Organic is another family owned farm, and their dried bosc pears made for a nice treat. I brought these to work for when I needed something healthy to snack on. Winter can be tough in the Northeast, and it was nice to receive the Healing Hemp Lotion in my box. It is good for dry skin but also other ailments like eczema. It is all natural and completely organic, so I can feel good about using this for myself but also on my kids. It has some great essential oils in it that makes it smell wonderful, like lavender, geranium, and rosemary. The Fay Farm company is committed to making all natural products, which is exactly the kind of stuff I love! 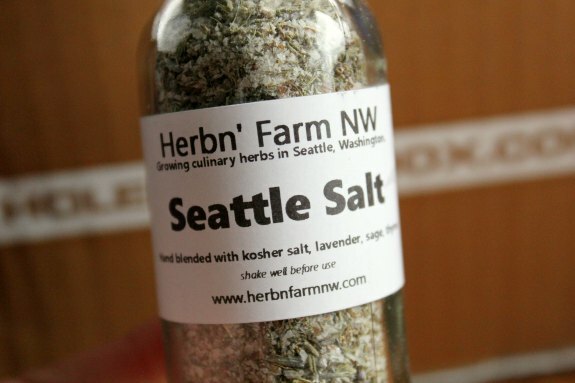 This is a pretty cool mixture of salt and herbs. It contains lavender, sage, thyme, kosher salt and garlic. I had a chance to try it on a few foods and it is really unique – a great way to add depth to something otherwise ordinary (like potatoes). These are quite interesting and unique caramels! I had to check out their website, and they have tons of other cool caramels too, like Absinthe with Black Salt. This company puts a lot of thought into using locally sourced, high quality ingredients – not to mention coming up with creative flavors. The funny thing about these cherries is that I was actually sent a box of these just a few weeks ago from a family member in Seattle! So it seems like the Hole in the Box is spot on when it comes to figuring out what are favorite local items! I devoured this chocolate bar pretty fast.. This is Boehm’s classic chocolate bar, wrapped with a beautiful illustration of Western Washington. Between the cold winter weather and being sick, my lips have been so chapped. I think I have pretty much had this lip balm in my pocket since the day it arrived. The ingredients are all natural, and profits from this company’s lip balms go towards saving the bees! I really enjoyed my Seattle edition of Hole in the Wall Box. All of the products are very nice, useful, and thought out. 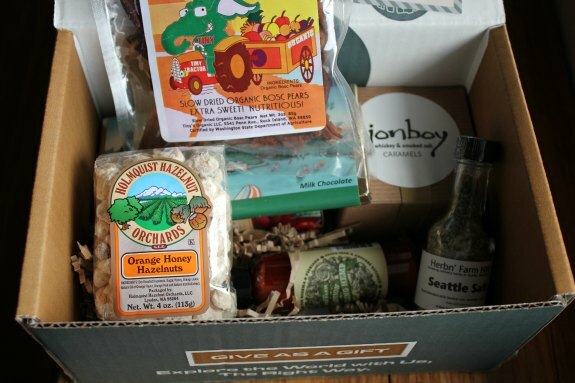 At home, I love supporting local businesses, and this box is a wonderful sampler of products from Seattle businesses. I loved learning about each one and hearing about how they used locally sourced ingredients or the history behind it. When I travel, I often have a hard time finding souvenirs that I like, because I try to minimize things like trinkets around the house. If I were to go to Seattle, this would be my kind of sampling from around the city! I see that the Hole in the Wall mission is much like mine when I travel! We avoid the over-saturated tourist spots, and seek out what truly makes a particular city special. 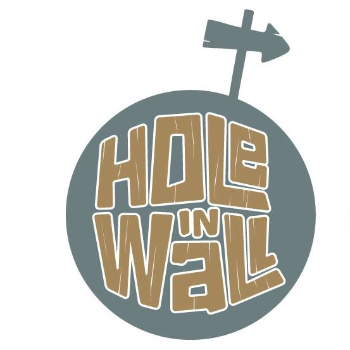 Hole In Wall is a travel subscription box that features unique goodies from mom and pop shops, delicacies from local farmers markets, and of course, gourmet treats from hole-in-the-wall restaurants. This box was so much fun and I am excited to see which cities they choose next! This subscription box runs about $30-35 per box (plus shipping) depending on the length of your subscription. This box was provided free of charge in exchange for an honest review, with the SocialBttrflyCo (Twitter: @SocialBttrflyCo). Now this is an awesome looking box! I love that it helps you explore different items from places near you! It is nice to find new home grown products. I think this is such an awesome box! I love that you can get a cross-section of a city in one box. Very cool idea! This is exactly the kind of box I would – finding new discoveries! That’s awesome! I mean visiting them all is of course the best but this subscription box is absolutely high up there! It would be a great gift too! Wow, I’ve never seen a subscription box quite like this! I admit that I’m sort of loving the idea of subscription boxes and I think they are a really fun treat every month! What a great idea for a subscription box! When I travel, I always shop the “Made in XXXX” stores for souvenirs. This is such an unique idea for a sub box. I love the little hometown treasures! I love this idea for a subscription box! I wouldn’t mind subscribing myself. Looks like some really great products. This is a sub box that I can totally get behind! That honey looks absolutely delicious. This is really great. I know there are so many subscription boxes out there, I love seeing what is in HOle in the Wall one, as I hadn’t heard of it before. I know I want one now, going to go check pricing. Whiskey candies and lavender salt! I would not be disappointed if this was my box, either! Eight full-size products for that price point is such a steal. Their name is really clever, too! Searching out places that locals know but tourists may not is a fantastic. This looks like a great subscription box. I love that there are so many out there. I love trying out new products, so boxes like these are great. Sounds like a great box filled with a lot of awesome goodies! I can imagine eating all of those chocolates as a reward when I come home from work! Love that it’s also packed with items I can use everyday. I’ve never heard of this box. I love that it’s a bunch of goodies from unknown companies! This is great. You can get to experience just a little bit of what makes some places special and unique right from a box. I’d love to try those hazelnuts. This is a great box! My husband loves hazelnuts and would love to try those. It’s always exciting to dig and find what’s inside a subscription box. 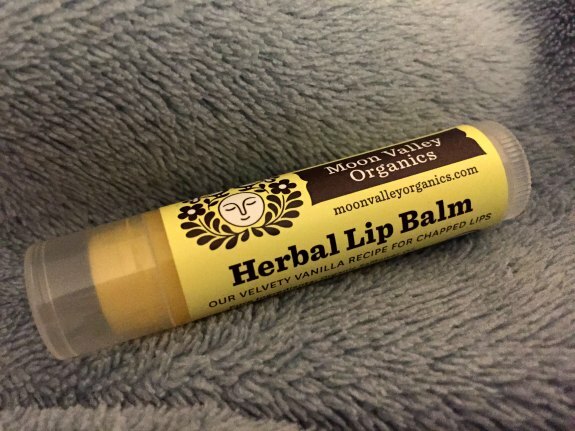 I would love to try the herbal lip balm. I can’t leave the house without a lip balm in my purse. Ohh what a fab idea! 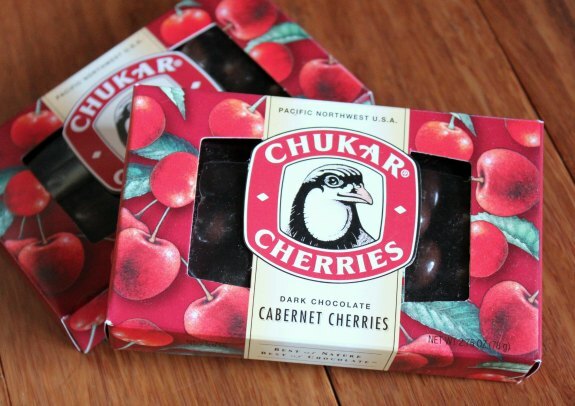 I love this, and those chunky cherries sound great! I love the excitement of a subscription box!